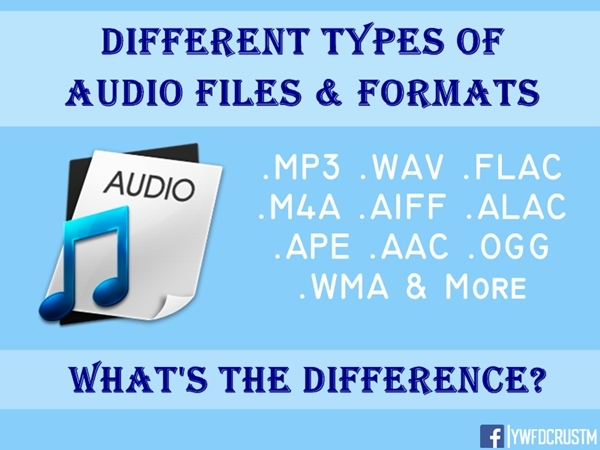 Different Types Of Audio Files & Formats: Which one provides best quality? Which one is more efficient? What's difference b/w lossless & lossy file formats? In simple language you can say lossless compression means "no loss of quality" & original data can be recovered when the file is uncompressed which means lossless file formats have higher audio quality than lossy file formats. What's difference b/w compressed & uncompressed audio file formats? Uncompressed files are the original studio recorded files & usually takes large storage space. When these files are compressed using different lossless or lossy techniques we get compressed audio files. There are only two well known uncompressed audio formats i.e .wav & .aiff. Uncompressed file formats are the exact copies of the original source usually audio CD. Both WAV and AIFF are uncompressed formats, these two formats are essentially the same quality; they just store the audio data a bit differently. AIFF is made by Apple, so we may see it more often in Apple products while WAV is kind of universal. Since they're uncompressed, they take up a lot of unnecessary space. Unless you're editing the audio for a project or something, there is no need to store the audio in these formats. Famous file formats in this group are: FLAC, ALAC & APE. FLAC (Free Lossless Audio Codec) is the most popular lossless audio format, making it a great choice if you want to store your music in lossless format. Unlike uncompressed WAV and AIFF, it's been compressed, so it takes up a lot less space. However, good thing is that it's still in a lossless format, which means the audio quality is still the same as the original source, so it's much better for listening than WAV and AIFF formats. FLAC is also free and open source. ALAC (Apple Lossless Audio Codec) is quite similiar to FLAC. It's also a compressed lossless file, but is made by Apple. It's compression is a bit less efficient than FLAC, so files may have a bit larger size, but it's fully supported by iOS & iTunes (while FLAC is not). This simply means you should use ALAC only if use iTunes and iOS as your primary music listening software. APE (Monkey's Audio) is a very highly compressed lossless file, meaning you'll get the most space savings with same audio quality as FLAC, ALAC, and other lossless files, but it isn't compatible with nearly as many players. As they are so highly compressed, it becomes harder for processor to decode (not suitable for low speed processors). Generally, I wouldn't recommend using this unless you're very starved for space and have a player that supports it or if you want to store your music for listening after 15-20years. MP3 (MPEG Audio Layer III) is the most widely used audio format, it's become synonymous with downloaded music. MP3 isn't the most efficient format of all but it's the most well-supported format for sure, making it our #1 choice for lossy audio formats. Only doubt that user feels while encoding to MP3 is that how much bitrate is enough? For me 320Kbps (VBR) is perfect. I'll try to write an article on MP3 encoding soon. AAC (Advanced Audio Coding) is similar to MP3 but it's a bit more efficient, which means that you can have files that take up less space, but with the same sound quality as MP3. As Apple's iTunes made AAC so popular, it's almost as widely compatible as MP3 now. Today there is likely no chance that you'll hear a player supporting MP3 but not AAC. M4A (audio only MPEG-4 file) is used by Apple for unprotected music downloaded from their iTunes Music Store. Audio within the m4a file is typically encoded with AAC, although lossless ALAC may also be used. Vorbis format aka Ogg Vorbis as it uses Ogg container. It is a free and open source alternative to MP3 and AAC. Its main drawback is that it isn't restricted by patents, but that doesn't affect you as a user—in fact, despite its open nature and similar quality, it's much less popular than MP3 and AAC, meaning fewer players are going to support it. As such, we don't really recommend it unless you are mad about open source. WMA (Windows Media Audio) was created by Microsoft, similar to MP3 or AAC. It doesn't really offer any advantages over the other formats and also not as well supported. No reason to store your music in this format. Still there may be many questions in your mind like which to use M4A or MP3? How much bitrate is enough? Best way to encode into MP3 or AAC? & many more. Will answer all these questions soon, stay updated about our latest posts by following us on our twitter account.